Heading off to work on a rain-soaked bike is unpleasant, and paying for an expensive apartment with a car-sized garage is even moreso. 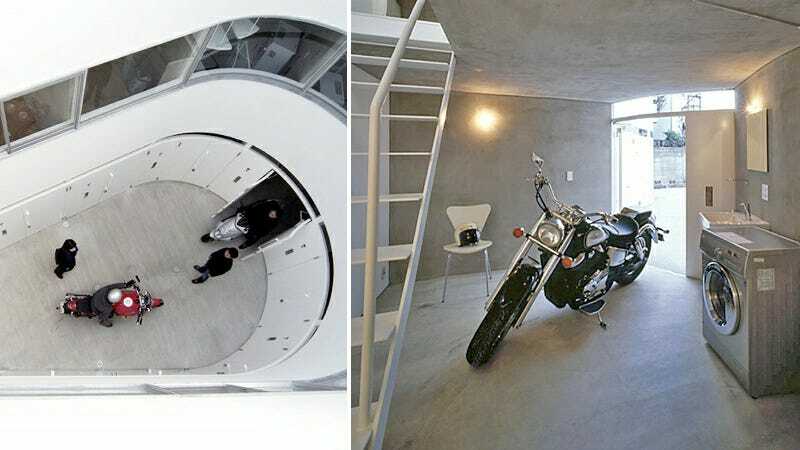 So Japanese architects have designed the perfect compromise—an apartment complex that integrates a compact motorcycle garage into each unit. The NE Apartments are geared for bikers, with each unit's double front doors opening wide enough to accomodate even the most porcine of Harleys. The bottom floor of each apartment serves as a garage/laundry room, and also provides access to the upper floors without having to go outside again. The complex's gracefully curved central courtyard is large enough for most bikes to turn around, simplifying each tenant's arrival and departure. The design offers what every biker needs— a safe place to store the ride, and a community that doesn't care how loud you rev the engine.